iOS 7 came bundled with many surprises, both in terms OS interface, And the functionalities implemented in it. Although much of iOS users stated that at least changes aspect of the new system were not a good idea to Apple (Jokes circulating even as it was inspired by Hello Kitty) Are enough and those who consider welcome and needed change and I think even those who currently fail to come to terms with the new interface will get used to it in time and will come to appreciate. If you are among those who new design of iOS 7 their winks and want to "borrow" for device with your AndroidThe most simple and accurate solution are applications Espier Launcher iOS 7 si Espier Screen Locker iOS 7. 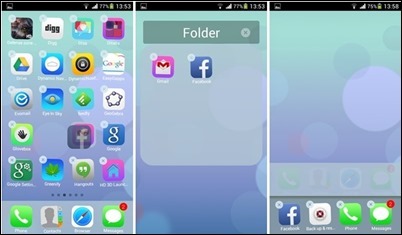 Espier Launcer iOS 7 is the only launcher for Android which perfectly mimics design the new operating system iOS 7. In addition, it is and acts as 7 iOS SpringboardBoth in terms of how "jiggle"(Shaking icons in module Edit), folders full screen, Gestures swipe etc. Background icons and of dock's dynamically change color depending on the color wallpaper siteAnd application icon Calendar is also dynamic, showing the current date and day. Another feature borrowed from iOS 7 it is Long pressing on any of the icons on the home that opens editing mode (Jiggle mode), which allows you to move icons as desired, adding and deleting them from the dock, creating folders and even Uninstalling in the system. 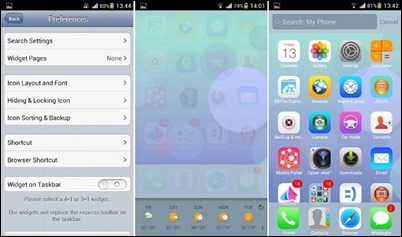 Jiggle mode applies to App Switcher (These can be accessed by swipe up pe iOS 7 Springboard), Where users can lock and delete the most recent apps used (though this feature can not be considered complete, considering that after removing applications from App Switcher yet these are shown in the native task switcher System Android). icons system toggles from App Switcher can be replaced by settings (activating Taskbar Widget) Of the order music playback or weather forecast depending on user preferences. And Search toolbar can be easily accessed with a simple swipe down 7 on iOS Springboard. Espier Screen Locker iOS 7 is also a perfect replica 's lockscreen iOS 7 (Even screen pass code imitates that of the new Apple phone system). Users can access the application Camera directly from Screen Locker giving tap on its icon and dragging it up. 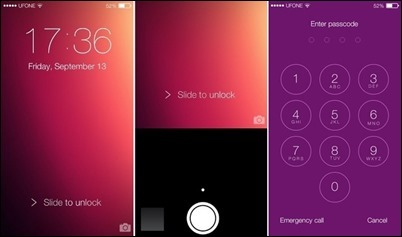 As CustomisationUsers can set a custom name for device and for mobile operator used, and can even change default text release (Slide to Unlock) and screen pass code change color depending on the lockscreen wallpaper siteBut in order to set a custom wallpaper for this application to be upgraded to paid version. Download iOS 7 Espier Launcher (via Play Store). Download Espier Screen Locker 7 iOS (via Play Store). 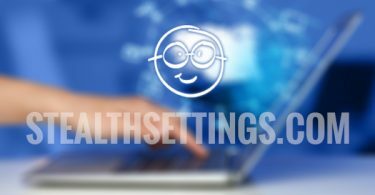 Note: The applications are compatible with the latest systems and 2.2 Android and Google Play are available free of charge.